How do you type a character with it's ASCII code? I need to type a form feed character 0x0C in ASCII on my mac. Is there anyway to do this? I've tried using emoji's and symbols from the edit menu, but its not in there. It's there for me in Character Viewer (Emoji & Symbols, expanded version). It doesn't have a glyph, but if you double click it should be inserted. Note that you may have to go to the gear wheel at top left and select Customize to add the Unicode category. 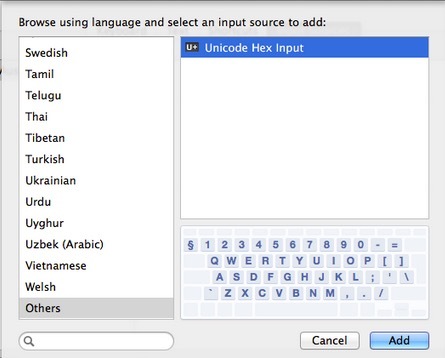 Add Unicode Hex Input as your Keyboard. Hold the option key while typing 000c. How to enable foreign/accentuated letters popup on ukelele (.keylayout) custom keyboard keypress? What are the key-names for the PressAndHold.app keyboard plists? How do I type a Greek delta with a circumflex?